America’s Most Deified Politician . . .
. . . has a birthday today that is celebrated throughout the land, especially at neocon think tanks and tabloids. I speak of course of the man the “Straussian” wing of neoconworld refers to as “Father” Abraham Lincoln. So I thought I’d offer some reading suggestions as part of today’s birthday celebration. 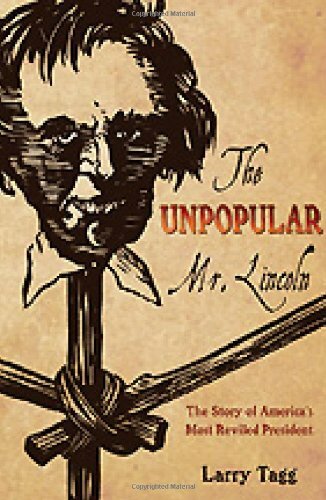 Lincoln was by far the most hated, despised, and reviled of all American presidents during his lifetime, as historian Larry Tagg documents in The Unpopular Mr. Lincoln: America’s Most Reviled President. His deification was the posthumous work of the Republican Party propaganda machine. Lincoln was very careful with his language when he explained to the world in his first inaugural address and other speeches that he was willing to enshrine slavery explicitly in the text of the Constitution (with the “Corwin Amendment”), but that he would invade any state that refused to collect the newly-doubled federal tariff tax and send the proceeds to Washington, D.C. So-called “Lincoln scholars” lie though their teeth about this, in other words. Lincoln’s invasion of the “free and independent” Southern states, as all states are called in the Declaration of Independence, was the very definition of treason under Article 3, Section 3 of the Constitution,which defines treason as “only” levying war upon the United States, or giving aid and comfort to “their” enemy. The word “their,” signifying the states in the plural, means treason is waging war against South Carolina, Virginia, etc. His lifelong racist and white supremacist rhetoric and actions would make David Duke blush. Not to mention his lifelong obsession with deporting all the black people out of America (i.e., “colonization), working diligently to accomplish that goal while in the White House until his dying day. Even Lincoln-worshipping historians have admitted that, had the South won the war, it would have justified in executing Lincoln and his entire high command for the war crime of mass murdering Southern civilians, as described here, here, and here. Lincoln promoted and lavishly supported the worst of these mass murderers of civilians, especially Sherman, Grant, and Sheridan. Like Lenin in Russia and Bismarck in Germany, he was the one person most responsible for the creation of the centralized, monopolistic, dictatorial state that Americans now slave under, as well as the abolition of the American system of federalism or states’ rights. That of course is why he was praised to the treetops by fellow centralizer Hitler himself, and congratulated by Karl Marx during his lifetime and by Marx’s political sons and daughters to this very day. In his last days, when genuine abolitionists (Lincoln always adamantly distanced himself from them) asked his assistance in getting the Thirteenth Amendment passed to legally end slavery, he refused to help them according to Harvard historian David Donald, the preeminent Lincoln scholar of the last generation.